Butterfly Tea Room Cross Stitch Kit. A scrumptious two tier cake stand of luscious cupcakes with a pretty butterfly. Change to your name to personalise the design. 14 count Cream, Zwiegart, Aida and DMC embroidery thread. 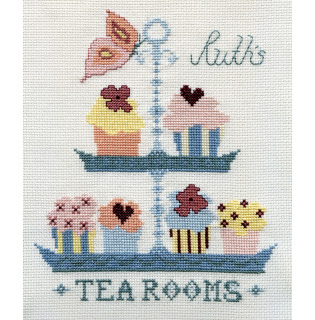 This scrumptious ‘Butterfly Tea Room’ Cross Stitch kit pictures two tiers of luscious cupcakes. This kit comes with everything you need to stitch this pretty vintage inspired design. Personalize the image by adding the name of your choice.. The pretty antique pastel colour pallet creates a classical feel, reminiscent of the tea rooms past. A piece of 14 count (14 stitches per inch) cream cotton, Zweigart Aida. An alphabet so that you can personalize your work finally & getting started instructions for any beginners.